Sumner’s rhubarb crops came a little earlier than rival Michigan because Michigan always had worse winters. So, Hazel Freehe explained that Sumner farmers would fill box cars as fast as they could and “get them rolling” to the East Coast, including cities like New York and Boston, to try to beat Michigan farmers, who enjoyed a closer proximity to the eastern markets. Gary Peterson remembers the Sumner football team helping out, using the loading process as part of their conditioning for football season. 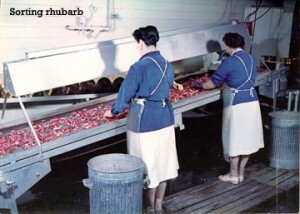 Field rhubarb was packed in boxes with inside dimensions of 6 x 11½ x 18¼ while hot-house rhubarb was packed in boxes 4 x 11½ x 18¼. Both sizes were four-slat unitized veneer covers and three-slat unitized veneer bottoms. The Association operated a nailing-shed and made the boxes before the packing season began. 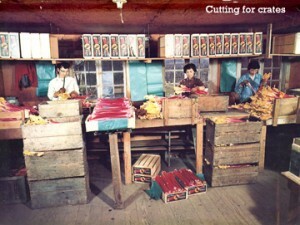 In packing, the leaves are trimmed off and the stalks packed in paper liners. There are three grades of packed rhubarb: Extra Fancy, Fancy and Choice (C Grade). Only stalks of the highest Fancy grade are packed for the fresh market. Any stalks not deemed of this quality are processed instead. 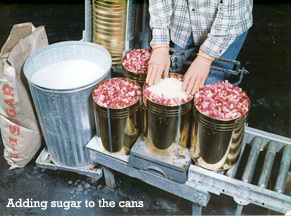 Much of Sumner’s rhubarb went to a processing plant in Seattle’s Georgetown neighborhood for canning…with lots of sugar added. Approximately 70% of the Association’s crop is frozen using the individually quick frozen process. 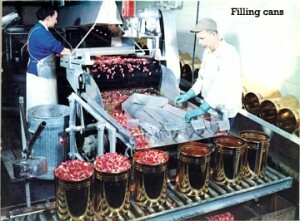 This rhubarb is packed in 30-50 pound containers for use in the baking industry.